The Giffords Center to Prevent Gun Violence and the Journal of the American Medical Association say weak gun laws lead to more gun deaths. We explore that argument. 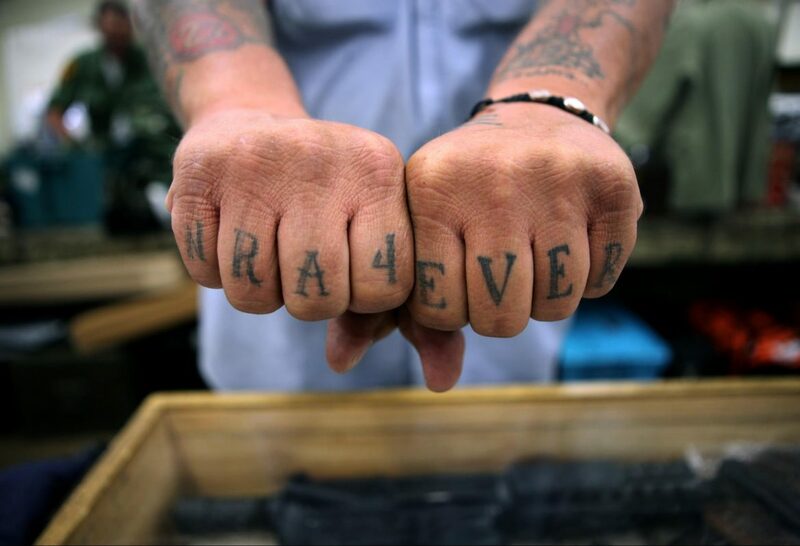 Here, Marty Brunner, who goes by the nickname "Machine Gun" Marty, shows off his "NRA4 EVER" tattoos at his booth at the Badger Military Collectible Show in Waukesha on Aug. 5, 2016. When it comes to gun laws and their ripple effects, Wisconsin may be its own worst enemy, according to one gun control advocacy group and a newly released study from the Journal of the American Medical Association. They found that the strength of state firearm restrictions can correlate to the level of gun violence in those states — and in nearby states. The Annual Gun Law Scorecard from the Giffords Law Center to Prevent Gun Violence is a state-by-state ranking of the strictness of gun control measures. Wisconsin’s laws rank 17th in the nation. However, the state’s gun death rate of 11.4 per 100,000 residents is 35th. The number of gun deaths in Illinois is more than double that of Wisconsin, but the rate is similar, 11.7 per 100,000 residents. That puts Illinois in 34th place for gun death rate, while the state’s gun laws rank as eighth toughest on the Giffords scorecard. Likewise, Maryland has the sixth strictest gun laws, yet its gun death rate is 32nd. Why the disparity? The Giffords scorecard attributes Illinois’ high gun death rate to gun trafficking from neighboring state Indiana, while Maryland’s high rate is tied to guns primarily from Georgia and Virginia. All of these neighboring states have less restrictive gun laws. 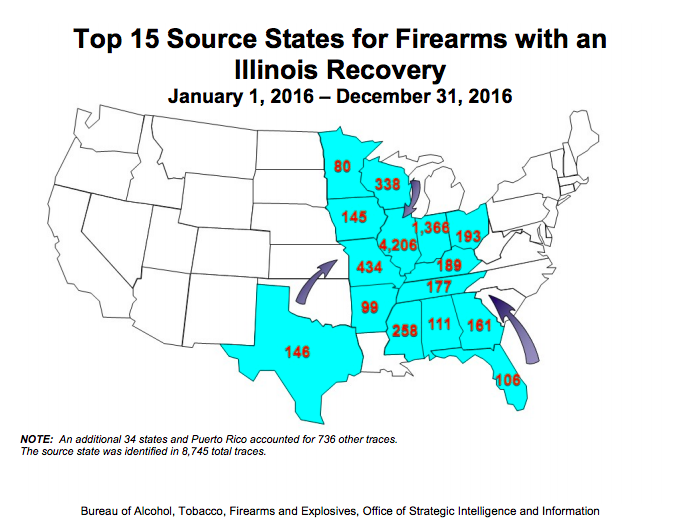 According to 2016 firearm trace data from the Bureau of Alcohol, Tobacco, Firearms and Explosives, states such as Maryland and Illinois trace 33 percent and 36 percent, respectively, of recovered guns to out-of state sources. By contrast, the share of out-of-state guns recovered in Wisconsin — which is bordered by three states with tougher gun laws — is only 13 percent. Of the 4,705 guns recovered in Wisconsin, 62 percent of them were obtained in-state, with the remainder untraced. The prevalence of trafficked guns illustrates the correlation between neighboring states’ weaker gun laws and the burden they place on states with stricter legislation. For example, the top suppliers of out-of-state guns seized by authorities in Illinois — which is ranked 8th for strictness — all have less restrictive state firearms laws than Illinois, according to the Giffords rankings. In Wisconsin, criminal background checks are required only for purchases from licensed dealers. Purchases from unlicensed dealers, including person-to-person, gun show or online sales, do not require a background check. This is more lenient than gun control advocates’ preferred option, universal background checks for all gun purchases. Gun owners also do not need a license to own or purchase, unless they plan to carry the weapon concealed, in which case a concealed carry permit, which includes a criminal background check, is required. The ease in firearm access increased after Gov. Scott Walker’s 2015 repeal of 48-hour waiting periods for handgun purchases. So even if a handgun dealer requested a records search on the buyer to the Department of Justice, the gun can be transferred to the buyer even if the background check is not finished. According to the Bureau of Justice Statistics, 4,388 prospective gun purchasers in Wisconsin were prevented from buying guns between 2012 and 2015 after they failed criminal background checks. Under state law, grounds for denial of permission to purchase guns in Wisconsin include people who are felons, a danger to the community, illegal immigrants, mentally unfit and those convicted for domestic violence or subject to a domestic violence protection order. Although no causation can be made, it is worth noting that Wisconsin’s gun death rate has ticked upward since 2011 after the state passed concealed carry, followed by elimination of the 48-hour waiting period in 2015. In 2010, the state saw 97 murders caused by guns, according to the FBI. By 2016, the number of Wisconsinites shot to death intentionally by firearms was 166. According to the Centers for Disease Control and Prevention, between 2014 and 2016, Wisconsin’s death rate by firearm — including homicide and suicide — went from 8.2 per 100,000 people to 11.4 per 100,000. Giffords’ analysis of all 50 states and the strengths of their gun laws showed that nationwide, lenient laws lead to more gun deaths, not fewer. Other researchers agree. An original investigation by the Journal of the American Medical Association compared death rates from January 2010 to December 2014 based on CDC data on suicides and homicides by firearm for 3,108 counties in the 48 contiguous U.S. states.